Gareth Long - Education: Mobile technology - why not? Funny really I think the story above is supposed to shock. It appeared recently in the national media - but what really made me question it is that so many schools do have already or want mobile devices for students - is it really news? Lots of schools want to, or already do use phones. I know of schools that expect students to have their phones on, (with bluetooth activated), to receive daily or urgent notices, messages etc from the school as a matter of course. I suspect that even the opening line of the article will be history soon - schools will want students to have access to the very powerful devices they always carry. Students may forget books, pens etc but few will ever forget their phones. Why shouldn't we utilise them - makes perfect sense really as we move to the middle of the 21st century. 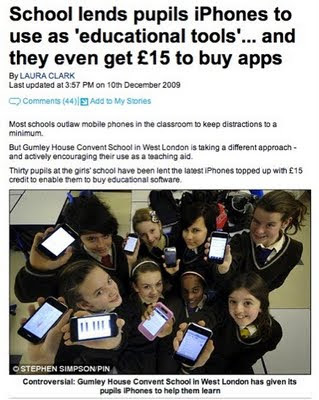 If the Gumley House School is trialling using iPhones - then good luck. They are certainly not the first - it surely is the way forward! iphones as an educational tools, why not? Those gadgets are really helpful in learning.